Even if you’ve never been to the South, you have GOT to try this recipe for my Perfect Southern Pecan Pralines! A cross between cookies and candy, this unique, melt-in-your-mouth treat is studded with pecans with a wonderful buttery flavor. Totally irresistible! I have only been to the South a couple of times, but each time I have gone, I have actively sought out pecan pralines. 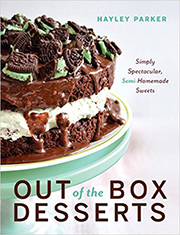 They are by far one of my FAVORITE desserts in both flavor profile and just as-is. However, I have only found Southern pecan pralines at the Atlanta airport, of all places. So you bet your booty I bought ALL OF THE PRALINES to take home and share with my California born-and-bred family. However, there was a small issue: I ate all the pralines on the plane. They truly are unlike anything I’ve ever had here in California. A cross between a buttery cookie and a melt-in-your-mouth candy, they’re totally unique and have an amazing butter and brown sugar flavor. Inside there are pockets of crunchy, salty pecans for an amazing toasted, nutty flavor. 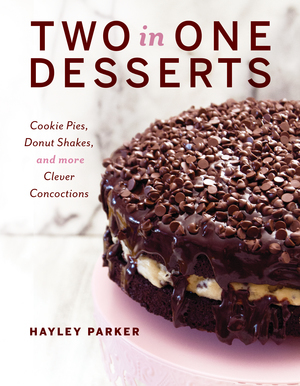 And if you’re like me, you’ll instantly fall in LOVE with these delicious creations! Pralines can be finicky little devils, but I think I have mastered this into an easy, nearly foolproof recipe. Some of the issues people have is that the pralines never set up, or they spread too much. But I have tips that will ensure your pralines come out perfectly round and utterly amazing each and every time with my tested recipe! To make these baddies, simply bring together some pecans, granulated white sugar, brown sugar, butter, evaporated milk, vanilla, and a pinch of salt together and boil it until a candy thermometer reads between 235° – 240° degrees F.
Then, once the mixture hits the sweet temperature spot, beat the daylights out of it with a wooden spoon until it thickens and gets almost cloudy-looking. This will ensure the candy is firm enough to set up properly. And to make those perfectly round morsels of heaven? Simply spoon the hot candy (be careful!) into cupcake liners and let cool completely. Once they’re cooled and set, simply peel back the cupcake liners and you have evenly round little pralines! And oh my gosh, they’ll be impossible to resist! 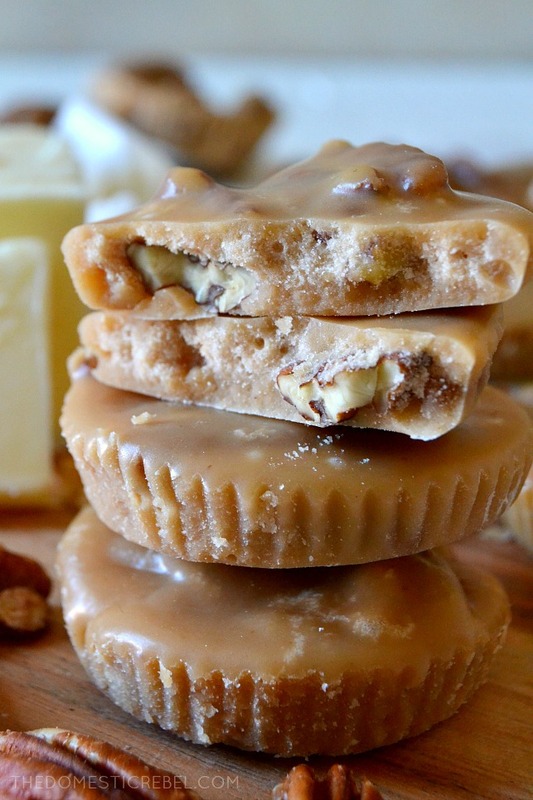 These Perfect Southern Pecan Pralines are a unique cross between cookies and candy! 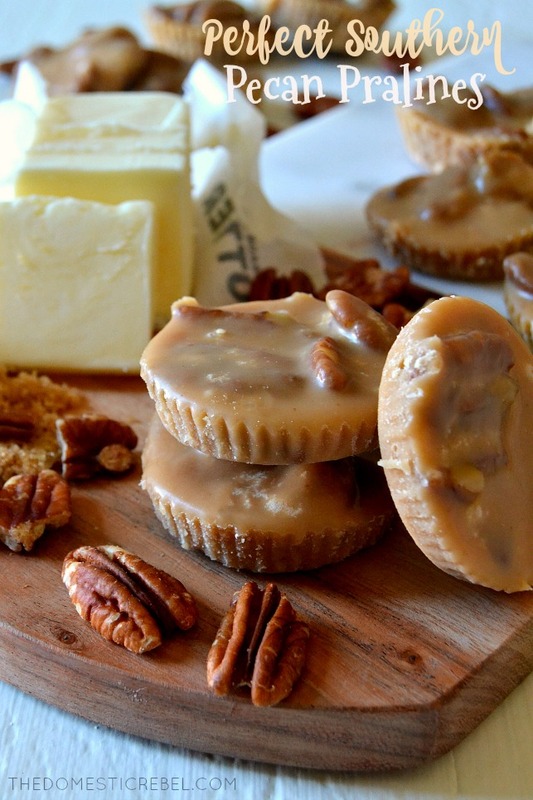 Flavored with butter, sugar, vanilla and toasted pecans, they're a melt-in-your-mouth candy you HAVE to try. Working fast, use a spoon or cookie dough scoop to portion the hot candy into each muffin tin, covering the bottom of the muffin cup. You should get about 16-20 candies, depending on how much you fill each cupcake tin. Cool the candy COMPLETELY. Candy is ready once it's reached room temperature and is firm and solid. Peel away cupcake liners before serving. 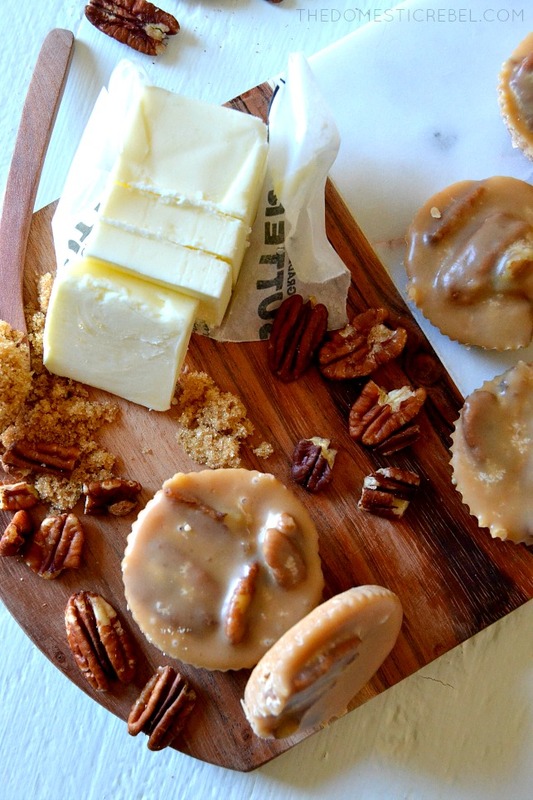 Buttery, toasty candies filled with crunchy pecans, brown sugar, and aromatic vanilla. 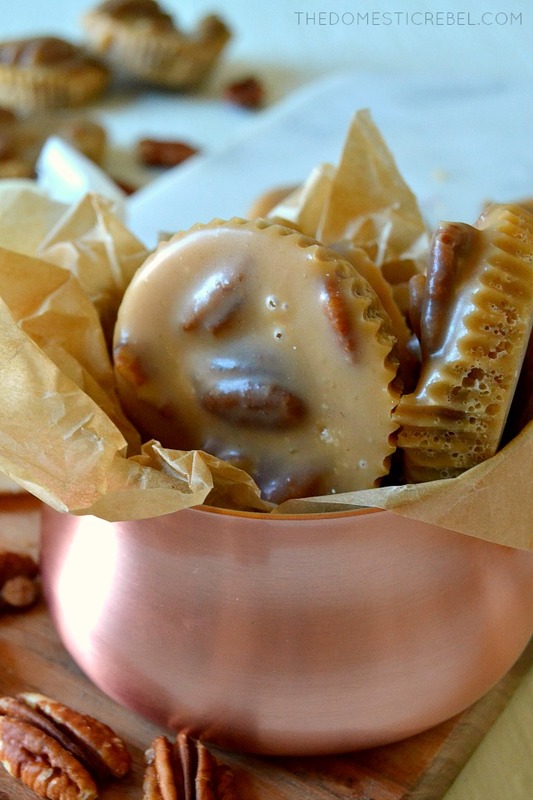 There’s so much to love about these pecan pralines! Why did I have to see this recipe while I’m hungry! Oh my gosh they look simply amazing! Can this recipe be doubled when making them or must it be made,in single batches like most other candy recipes? I would recommend making this in single batches. However, I’ll try to double it next time I make it and will report back! can you tell me are these soft and creamy ? Are they a little firm and hard ? Can you please let me know ? Hi Jo! They are firm when you bite into them (but not tooth-breaking hard!) but once you’ve bitten through, they are almost creamy and basically melt in your mouth. Very delicious! Soft and creamy, kind of like fudge. I’m from Louisiana and have made these many times. They are very much like fudge. Marjorie, lucky you for living in the praline epicenter! 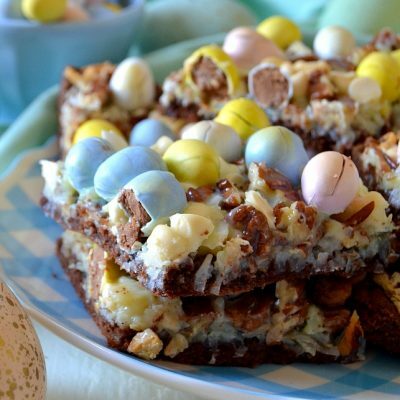 They are like a fudge, cookie, and candy crossover and are so delicious. Atlanta Airport the only place you could find Pralines! You must not have looked for long or maybe Atlanta has seceded from the South. Try Savannah Candy Kitchen. They ship all over the world. And next time you travel to GA visit Savannah or any of the coastal cities. And the way we make pralines here is to pore the hot mixture onto a cookie sheet with wax or parchment paper lining. Then you break it apart like brittle. There’s a Savannah Candy Kitchen IN the Atlanta Airport! And they make pralines there just like at the store in Savannah. I’m a praline-connoisseur, and I scope them out all over the Deep South, because I grew up in the south but now live in South Florida. No pralines here. 😢 I even ordered pralines from Savannah Candy Kitchen for wedding favors WAY back in 2002! Love pralines so much!! They have a candy store at the underground in Atlanta. They’re amazing !!! These look SO good! I second the above, Savannah Candy Kitchen! I also live in CA, and when I visited my sister in Savannah, I brought them back pralines from there. They have a great website you can order from. Do you have to use a wooden spoon? I would worry that a rubber spatula would melt! how can you store these? Hi Aileen, at room temperature! Probably! Just bring them to room temperature before eating. 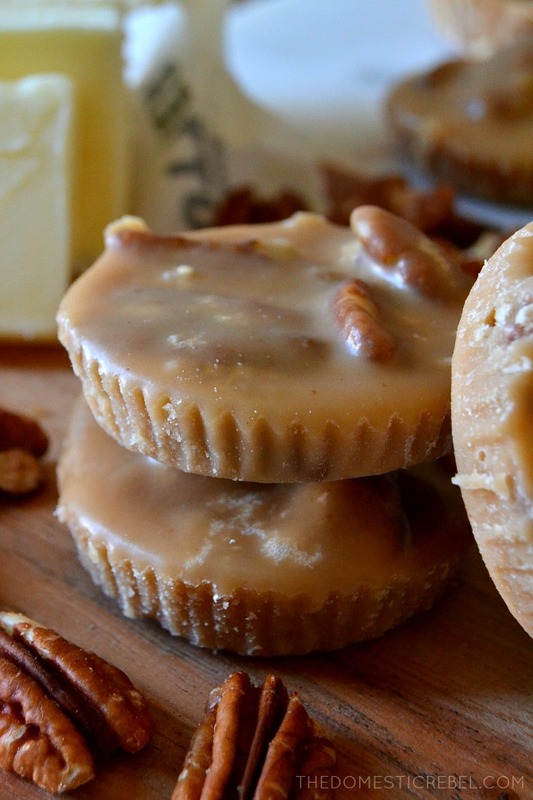 I’m from Texas and these pecan pralines were a huge hit with my family. They were easy to make and your notes of how to get the right texture helped. Using cupcake tins and liners was a great idea and made it easier to store. Thanks for a great recipe! Never made candy before but these seemed too good not to give them a try. They were delicious and a big hit with all my guests. I poured them out onto a silpat mat and broke into pieces when set. Can you beat these in a kitchen aid mixer instead of using a wooden spoon? Thanks. Hi Linda, I would recommend beating with a wooden spoon so you do not accidentally over-mix with a mixer. Make these in single batches. If you double it, you won’t be able to drop it on your parchement paper fast enough and it will set up inside your pot! Made these today and I must have cooked them too long…they turned to a fineish dust which would not scoop, nor stick together. It will make a topping for ice cream. Do you toast the pecans? I personally did not, but you totally could! I have sore shoulders from fubro. Can I start mixing with a mixer for a few seconds and then switch to wooden spoon when starting to get thick? You could try that, but be very judicious with the mixer because you don’t want to over-beat it! Hi I make these all the time here in Louisiana and I must say that’s a great idea about the muffin paper thanks ill have to try that! I made these and they stuck to the cupcake liners! I bought the white Wilton ones. Is there something you do to make them not stick? Hi Alicia! Sorry about that. It sounds like the mixture wasn’t properly beaten well enough. It has to be really cloudy and thick before you pour it into the cupcake liners. Hey. I tried double batch,but it never really firmed up. It’s a lot like a warm starburst. Any suggestions? We are coastal so it is humid. Tastes delicious though. Hi Anne, I personally think candy is best made in a single batch, even though the process will take longer. Maybe try letting it dry out overnight? Can I use margarine instead of butter? My candy thermometer got broken can I use another method? No, you cannot use margarine instead of butter.